Google recently rolled out some exciting news for content creators, publishers, and most importantly, content consumers with an open source project called Accelerated Mobile Pages, or AMP for short. It promises to deliver mobile content faster and more streamlined than is currently happening on most websites, even responsively designed ones. The need for AMP arose from the relatively sluggish and at times distracting way that mobile content is being served up, even in today’s world of high-speed connections and powerful mobile devices. If you’re a non-techie owner of a WordPress site (self-hosted, not WordPress.com which automatically implements AMP), I’ll show you how to integrate it like a pro with a few simple plugins and settings. First, log into your WordPress site’s backend. From the left-hand menu, navigate to Plugins > Add New. In the Search Plugins field, type “AMP” and hit the ENTER key. Install and activate the one called AMP (by Automattic). If you use the Yoast SEO plugin, you will need a second plugin to make it work with AMP. If you don’t use Yoast SEO, skip to step 5. Once again, navigate to Plugins > Add New and this time search for Glue for Yoast SEO & AMP (by Joost de Valk). Install and activate it. Test a page by going to a blog post and appending /amp/ to the end of its URL. 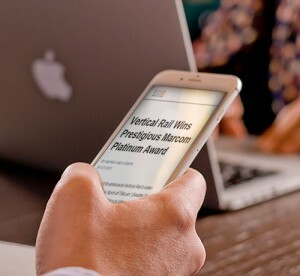 For example, https://www.verticalrail.com/2015/10/30/vertical-rail-wins-marcom-platinum-award/amp/. Be sure to check Google Analytics to see if pages are tracked correctly. As time goes on, Google will surely tweak and add more powerful abilities for AMP, delivering an increasing optimal and streamlined experience for folks on the go!